Imagine you’re a time traveler visiting current-day downtown Iowa City from an earlier time. Upon exiting your DeLorean, parked in front of the Airliner, you walk south and hang a left on Washington St. passing the beautifully restored MidWestOne Bank building. As you walk east you focus on the architecture of the buildings around you: stone building fronts, tall storefront windows and beautiful brick buildings like The Jefferson. At the intersection of Washington and Dubuque you look south, down the Ped Mall, and take in the glass of the 14-story Park@201, which at certain times of day reflects the brick of surrounding historical buildings. You take pause. What does it mean: the juxtaposition between new and old? What does it say about the values of this 21st century community? How is the architectural makeup and diversity of the downtown representative of how society has progressed? After a year as the Retail Development Director for the Iowa City Downtown District, I’m convinced history serves as our greatest asset. From a business and development perspective, this city’s legacy, built on the backs of early Iowa City trailblazers like Chauncey Swan, John Gilbert and Isaac Wetherby, has become our most valuable differentiator. Many municipalities don’t have the well-preserved building stock and rich history we enjoy. Such areas only have black and white snapshots to remind them of their roots. Iowa City’s past has been successfully intertwined with its future. A simple glance while walking in our downtown reminds us not only of where we came from, but where we are going. We have succeeded in this relationship because of balance. It is our responsibility to carry this tradition forward as we grow. Undoubtedly, it’s this “spirit” that plays the leading role in the downtown experience of Iowa City. How do we foster this spirit while continuing to grow and strengthen our downtown? And how do we do this while being constricted by the near-downtown neighborhoods or university campus? Such questions have played a large role in the social narrative over the past four years and at times have caused tension. There seems to be an identity crisis in Iowa City as we face increasing demand for downtown housing, office and retail space. We hesitate to continue mixing new, architecturally unique buildings downtown with beautiful older buildings. Yet we celebrate the artistic, entrepreneurial and educational scenes that have thrived downtown thanks to both the preservation of old and the creation of new developments. We have a proven track record of fostering the authentic Iowa City spirit in the midst of modern buildings like Park@201, Plaza Towers and the soon-to-rise Chauncey Tower. The sky has not fallen on Iowa City while these buildings were built. Residents, businesses, entrepreneurs and university employees continue to look downtown for housing and office options. If we don’t continue meeting this demand, it will move elsewhere and the urban core will stagnate. So, how do we do this? The current options on the table are to expand south across Burlington St. into the area dubbed “Riverfront Crossings,” to better incentivize property owners to rehab older buildings or to create more density in the downtown core by going vertical. Some would argue, myopically, that all new development should be focused solely in Riverfront Crossings, leaving the downtown core in a “preserved state.” But with the highly trafficked Burlington St. serving as a tangible divider and the lack of old building stock to repurpose, Riverfront Crossings will always be separate from downtown and different in the sense that it cannot imitate downtown’s uniqueness of character. This new area of development will, and should, serve solely as a complement to downtown, not a substitute. And demand will reflect that. Some will want to live or rent offices in Riverfront Crossings and some will continue to seek out downtown due to its compactness and proximity to campus and other amenities. Look around the country: Most all city centers have adjacent new(er) districts, yet these municipalities haven’t pushed the pause button on development in their original downtown core. Plus, key infrastructure improvements to Riverfront Crossings are years away and the demand to be downtown exists now. The most sustainable and efficient way to grow and meet this demand is to remain focused on current opportunities within downtown while thoughtfully building up the area to the south. With a current vacancy rate of less than 2 percent, we risk becoming sluggish in matching the uptick in current demand with increased supply, thus resulting in a continued rise in rent prices. Most housing options are priced at a level only feasible for a small percentage of highly affluent students or high-income professionals. First-floor commercial rent rates have crept into the $35-$40 (gross) per square foot range. I cringe to think what these rents will do to some of our beloved locally owned shops and the livelihoods of the human beings who own them. Not to mention the numerous other aspiring small business owners who desire to pursue their dream downtown, but find barrier to entry too high. Long term, the rare vacancies will go to the highest bidder and inevitably be filled by national fast food chains. Our downtown then runs the risk of taking the form of a glorified food court, similar to those you might find in a mall. The unique Iowa City spirit we are responsible for furthering will succumb to the forces that have sucked authenticity out of so many other cities before us. Looking out decades into the future, if our urban core cannot accommodate residential demand then the growth will inevitably be pushed outwards to the suburbs (as it has for the past two decades) creating an even heavier reliance on the automobile and choking downtown off even further from the day-to-day user patterns of Iowa City area residents. Ultimately, downtown could become a relic, an amusement park of sorts where people will visit on occasion to be entertained, while the normal day-to-day relevance of downtown is relegated to serving the needs and wants of university students, faculty and staff. Nothing more, nothing less. Just a downtown in form, not true function. We’re lucky that the demand we face is from baby boomers looking to retire here, the creative class looking to start companies, artists looking for an inspiring and welcoming environment and those coming to further their education. We have the space and opportunity downtown to continue our healthy and vibrant growth. The surface parking lots on the corners of Washington and Linn and Burlington and Clinton are great places to start. The zone just to the east of Gilbert St. including the future site of the Chauncey and the entire Civic Center campus lends itself to higher density. And non-historically-significant buildings, such as the two properties between Hands Jewelry and The Jefferson on Washington St. are excellent opportunities to build new and scale vertically to meet demand. Not all progress needs to take the form of new construction. Adaptive reuse of our historically significant buildings is a great way to create attractive commercial and residential space. Recent examples include the 2013 renovation by the Moen Group of the 145-year-old Packing & Provisions Building at 118 E. College St. After a multi-million dollar overhaul of the interior, the building now houses a popular women’s clothing store, plus FilmScene, which hosts more than 35,000 moviegoers each year, and Modus Engineering on the second floor. Mark Ginsberg recently completed the revamp of the former Whitey’s building at 112 E. Washington St., which attracted the Raker Rhodes Engineering firm and a soon-to-open men’s clothing store. Many other historic buildings downtown are underperforming and in need of major improvements, especially on the second and third floors. The Iowa City Downtown District offers an incentive program called the Property Evaluation Program to ICDD property owners to help them evaluate the feasibility of making building improvements. The goal of the program is to provide real data (rather than just assume renovation is implausible) to incent private investments in targeted areas to bring underutilized space back on the market. Additionally, ICDD advocated to the City of Iowa City in 2012 for matching grants to help incentivize upgrades to historic buildings, in particular improvements to façades. The city responded through its Building Change program which has received, to date, approximately 40 proposals for close to $2 million in improvements to downtown buildings. Unfortunately, the city doesn’t budget for the Building Change program. Rather, it waits to see if there is any funding left at the end of the year to offer a sort of “flash match” for improvement. Since the city isn’t budgeting this incentive program, property owners can’t plan for improvements and, as a result, the funding isn’t always as impactful (think new awnings versus whole façade reinvestment). The upkeep and adaptive reuse of historic buildings is risky and highly expensive. The ICDD has worked with the city to create a new set of design guidelines to encourage new businesses to respect the architecture and think more broadly about their historic assets. It’s a step in the right direction for preservation hopefuls. The city needs to do more to ensure our historic buildings are attractive and viable for decades to come by adding a dedicated annual line item so property owners are encouraged to continue to invest in and restore these amazing properties. So, we were founded by visionaries and pioneers. That’s part of our identity. We are risk takers, innovators, progressive thinkers. We are forever defined by our relationship with the State University of Iowa. We are diverse, open and highly educated. We have a deep love of literature, art and athletics. We are hard working, humble, community-minded. 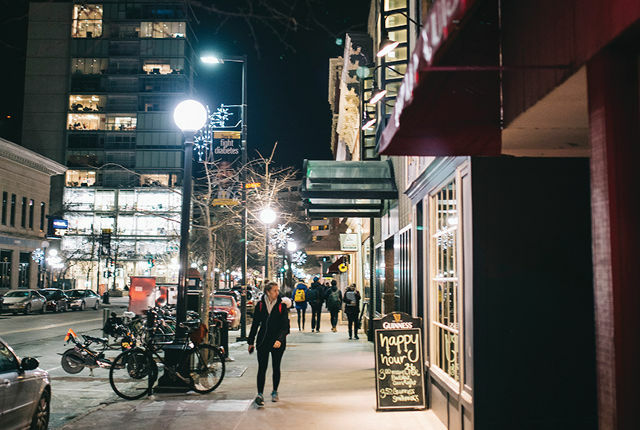 Physically, our downtown is unique in the sense that it is attached at the hip with the university campus and it is relatively compact. It is highly walkable, three square blocks at its core, bite-sized. To me, that’s our identity. Now, can we evolve and progress without losing our identity? We have no choice. Time is barreling forward. Pragmatic forces are at play. The value of a lively and vibrant urban core, marked with a blend of beautiful historic buildings and innovative new construction, tells a story of our identity that illuminates a path forward through this century. There’s no greater way to pay homage to, and channel, the pioneering spirit of Swan, Wetherby and Gilbert than to untether ourselves from the constraints of preservation for preservation’s sake and strive for new heights for our beloved city. Nate Kaeding was born and raised in the Iowa City/Coralville area. He has a B.A. in history from the University of Iowa. In addition to his work with ICDD he is a founding partner of three downtown businesses located in historic buildings: Short’s Burger & Shine, Tailgate Clothing and Pullman Bar & Diner. This article was originally published in Little Village issue 196.